While we discovered some birdhouses along the banks of the Gowanus Canal, the tide was low, uncovering more secrets, including a Victorian birdcage, a few tires, bottles, an air conditioner and some other stuff that was beyond recognition. The interesting thing was that everything was some sort of shade, even the silty bottom of the Canal. And while we're glad to see birds, ducks, fish and even Sludgie surviving in the Gowanus Canal, its sad to see this much crap in this historic waterway. We assume most of the big stuff was dumped in there, but most of the smaller stuff enters the canal via the storm drains. When it rains really hard, all of the junk that my neighbors toss into the street, including those McDonalds meals, soda bottles, cigarette butts, lottery tickets and candy wrappers end up in a storm drain and that stuff -- at least the trash in my neighborhood -- ends up overflowing into the Canal and then out to sea. You never know what you will see along the Gowanus Canal. Along both sides of Degraw Street is a small group of canary yellow birdhouses -- an installation called the Canal Nest Colony. The birdhouses, or "nests" are crafted from recycled materials and hope to attract the Eastern Bluebird and and Purple Martin Additionally, two trees were planted along a drainage area to filter pollutants. We really like it for a number of reasons, but mostly because it highlights the unique beauty of the canal. Breezy Point, which the New York Times calls "the whitest neighborhood in the city," is a small neighborhood of about 2800 homes on the Western end of Rockaway Point. Known as the Irish Riveria, Breezy Point is the only private beach in the five boroughs and run as a cooperative where the Breezy Point Cooperative, Inc. owns the land and the co-op members own the building only. Houses rarely go for sale on the open market and are typically sold through word of mouth. If you do find one, you'll have to need to put at least 50% down and use to use one of two co-op approved banks. You will also need three references from established residents, a large percentage are fourth and fifth generation. You'll need to do all of this prior to getting board approval. The neighborhood, which is gated, with security guards, has no schools and very limited shopping. In addition to the seclusion and beautiful beaches, It is the home of the Rockaway Point Yacht Club and also has one of the most diverse populations of state and federally listed collection of shorebirds in the area, with over 1,000 nested terns (non-gull birds) in the co-op. Non co-op members can visit Breezy Point by picking up a free one-day permit at the Jacob Riis Park Visitor Center, which will permits a car to park at the lot at the end of Rockaway Point Boulevard. Or do what we do, and check it out from the water. Either way, you won't be disappointed. It is really amazing how many international sailboats come through Brooklyn. Earlier this year, Thomas Coville's maxi trimoran Sodeb'O was moored at Gateway Marina prior to its attempt to set a North Atlantic crossing record. And last year, we came across the crew of S/V Pasha, who came to Brooklyn in search of a laundromat. I was fortunate enough to go sailing this weekend. With Baby Salt's arrival, it has been rather difficult squeezing in time for a sail (more on that to come). Following the sail, we saw the sailing vessel Safari of Howth, a Halberg Rassy 42, docked at Miramar Yacht Club. The ship, owed by Carmel & Ken Kavanagh, hailing from the Howth Yacht Club, was easily identified by its Irish flag flying from the stern. Safari of Howth left Ireland about two years ago and comes to Brooklyn by way of a long journey which included stops in the Caribbean, Florida and up the Eastern Seaboard. The boat will be in Brooklyn through the end of August, then will sail to the Chesapeake and Washington areas where they will stay until mid-October. Then its back to Ireland for Christmas. The skipper, graciously invited us aboard, prior commitments kept us from accepting his offer. And while we didn't board the Safari of Howth, the skipper didn't leave us empty handed. We were each handed a beer prior to our departure. Our good friends at Gage & Desoto Design sent us a shot of two sailboats docked against a bulkhead on the Brooklyn side of Newtown Creek. The small sloop looks to be under 20 feet with the other in the 29-to-33 foot range. Of course we don't have any information about these vessels, their captains or the sailing scene along the Brooklyn/Queens border, but we're happy to see more sailboats in unusual spots in Brooklyn. We really like Olfar Eliasson's "The Waterfalls"particularly because it is bringing so many people to New York City's Upper Harbor and the installation brings the entire landscape of the waterfront, from Governor's Island up the East River to the Manhattan Bridge. And the waterfall that is installed underneath the Brooklyn Bridge is particularly spectacular, not only from the Empire-Fulton Ferry State Park, but also from the Manhattan side. We do, however feel sorry for the lonely, unappreciated waterfall, that sits off the Montague St. entrance of the Brooklyn Heights Promenade. First, from the promenade, the viewer sees more structure than it does waterfall, and it is virtually impossible to hear because of the noise from the BQE. 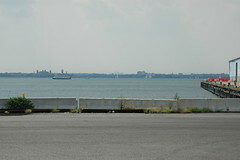 To its credit, however, it does make the viewer pay attention to Governor's Island and its waterfall. And its site on Furman Street, while accessible by bicycle and on foot is rarely trafficked, surrounded by fences and barbed wire, but there are spots where the view is priceless.